Our Tent box match is like a two-sided standing billboard for a home mantelpiece. 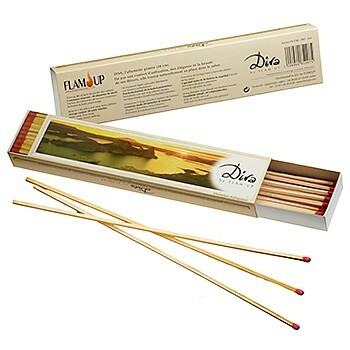 This Fireplace version holds 40 strong 4" sticks with a choice of 16 standard match tip colors. A great advertising tool and a ton of space to show off a liquor brand, a hotel, or a new promotion. "Base Price" includes 1-color imprinting on 2 sides and bottom of outer cover & UV gloss coating. Our Tent box match is like a two-sided standing billboard for a home mantelpiece. 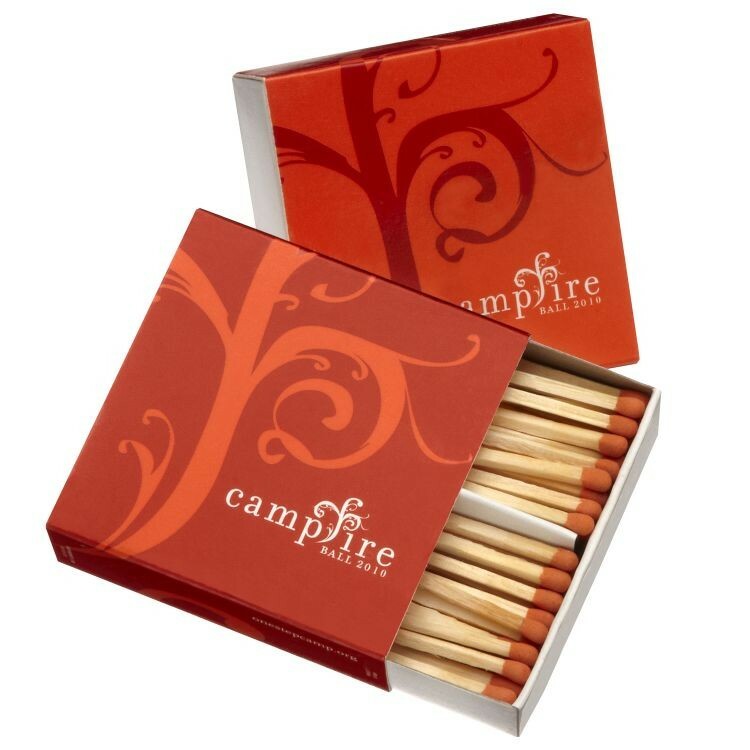 Its 2 compartments pack 135-140 regular 2" sticks with a choice of 16 match tip colors. A great advertising tool and a ton of space to show off a liquor brand, a hotel, or a new promotion. "Base Price" includes 1-color imprinting on 2 sides and bottom of outer cover & UV gloss coating. The Kitchen box, having 2 compartments holding 135-140 sticks with a choice of 16 match tip colors, belongs in the home. Customers will not be running low on matches with this supply. Each customer's use of Kitchen box can promote more business. It's a mantelpiece billboard that prominently displays your logo and brand in full detail. "Base Price" includes 1-color imprinting on 3 sides of outer cover & UV gloss coating. Enter the majestic "King" box with a wealth of 60 strong 4-inch sticks and a choice of 16 match tip colors. They make the King box a must for anyone whose household needs and pleasures rely on a perfect match. The King prominently displays your logo and brand in full detail. It's a billboard for the home mantelpiece. 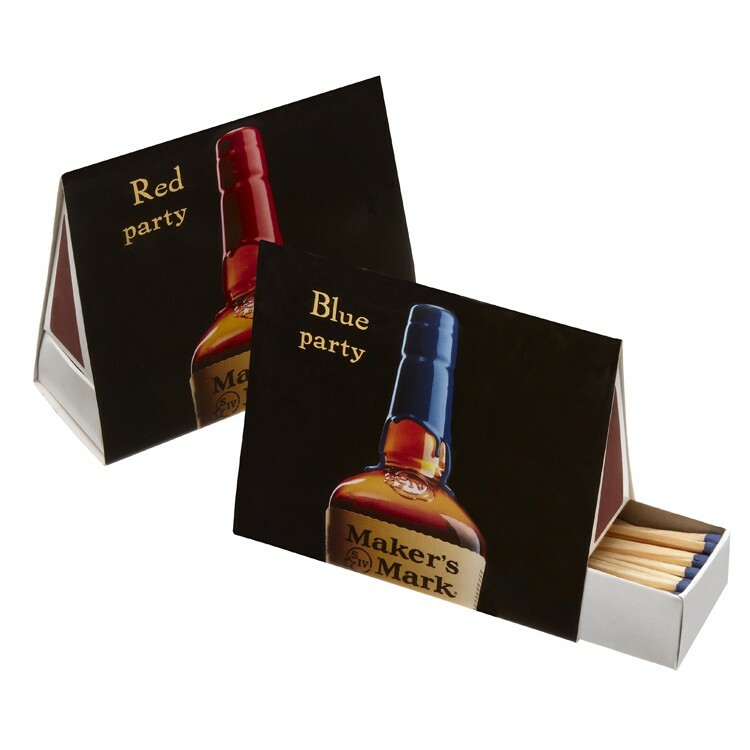 With each customer's use your matchboxes can promote more business. "Base Price" includes 1-color imprinting on 3 sides of outer cover & UV gloss coating. 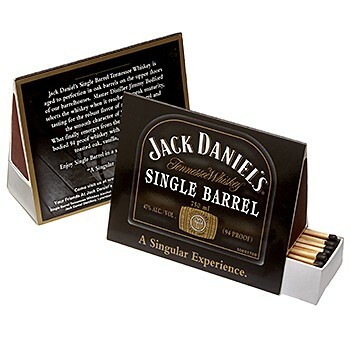 The Desktop matchbox, containing 78-79 sticks with a choice of 16 match tip colors, is a pipe or cigar lover's dream. Enough matches for a humidor full of Cuban cigars! From a branding perspective, what better way to show-off your image and logo than having this box situated on a customer's desk ready as needed. "Base Price" includes 1-color imprinting on 3 sides of outer cover & UV gloss coating. 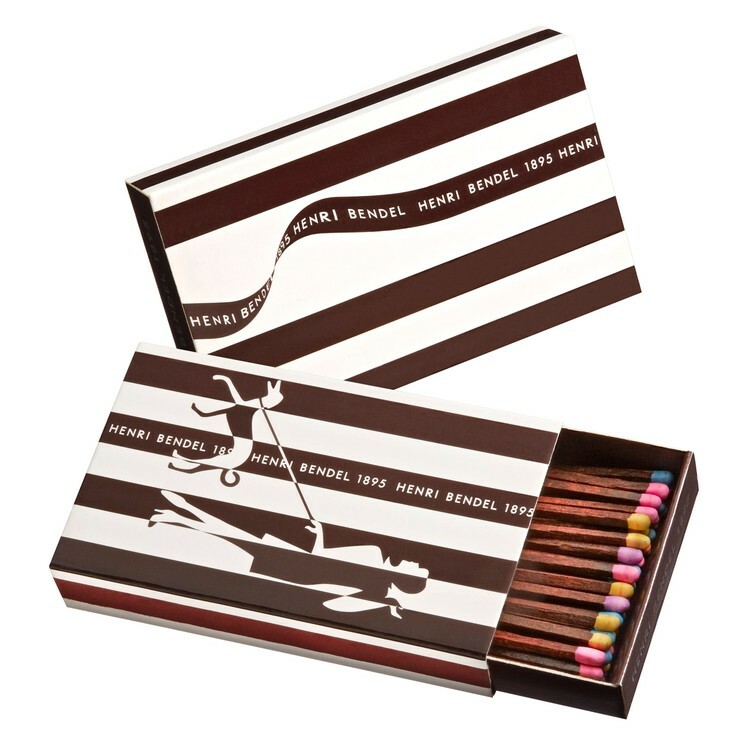 Containing stilts-like 11-inch sticks with a choice of 16 match tip colors, the Showcase matchbox is our largest style. Perfect for campfires, BBQ's, fireplaces, and other home and outdoor functions that demand the longest-lasting flame, Showcase is the one that will always be up to the task. "Base Price" includes 1-color imprinting on 3 sides of outer cover & UV gloss coating.